Bolger, L.E., Bolger, L.A., O’Brien, W., Burns, C., Coughlan, E., & O’Neill, C. (2015) ‘I can walk, I can talk but…I just can’t jump!’ [poster]. Presented at The International Society for Behavioral Nutrition and Physical Activity (ISBNPA), Edinburgh, Scotland, 3rd -6th June 2015. O’Leary, M., Burns, C. Coppinger, T. (2015) ‘Baseline measures for a school based health promotion programme: Project Spraoi. Differences by class group and gender’. Presented at All Ireland Postgraduate Conference in Sport Science and Physical Education, University of Limerick, 23rd January 2015. Bolger, L.A., Bolger, L.E., Burns, C., O’Neill., Coughlan, E., O’Brien, W. F (2015) Fundamental movement skill proficiency across age and genders among Irish primary school children. Presented at All Ireland Postgraduate Conference in Sport Science and Physical Education, University of Limerick, 23rd January 2015. 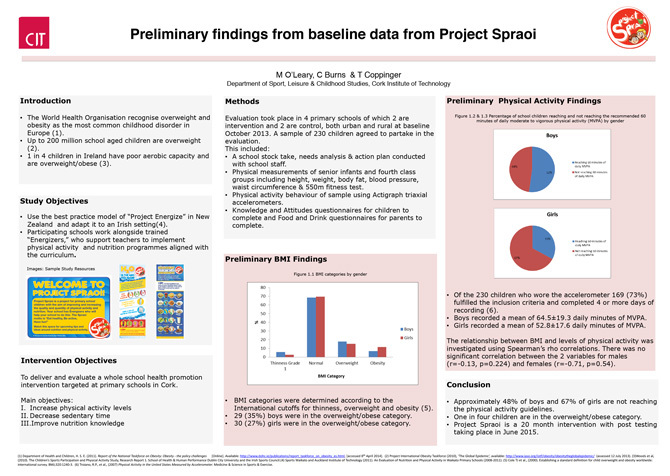 O Leary, M., Burns, C., Coppinger, T. (2014) ‘Preliminary findings from baseline data from Project Spraoi’ [poster], Presented at Physical Education Physical Activity and Youth Sport (PE PAYS), Waterford Institute of Technology, 6th June 2014. 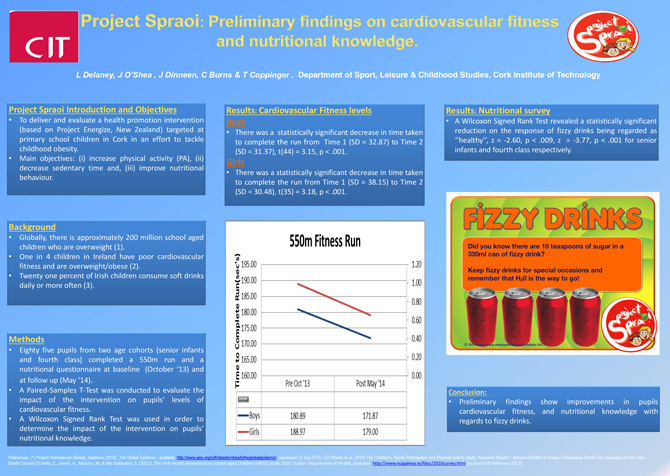 Delaney, L., O’ Shea, J., Dinneen, J., Burns, C., Coppinger, T. (2014) ‘Project Spraoi: Preliminary findings on cardiovascular fitness and nutritional knowledge’ [poster], presented at Physical Education Physical Activity and Youth Sport (PE PAYS), Waterford Institute of Technology, 6th June 2014. Delaney, L., O Leary, M., Neville, J., Dinneen, J., O’Shea, J., Collins, N., Burns, C., Coppinger, T. (2014) ‘Project Spraoi: A strategy to improve nutrition and increase physical activity in Irish primary schoolchildren’, presented at All Ireland Postgraduate Conference in Sport Science and Physical Education, University of Limerick, 24th January 2014. 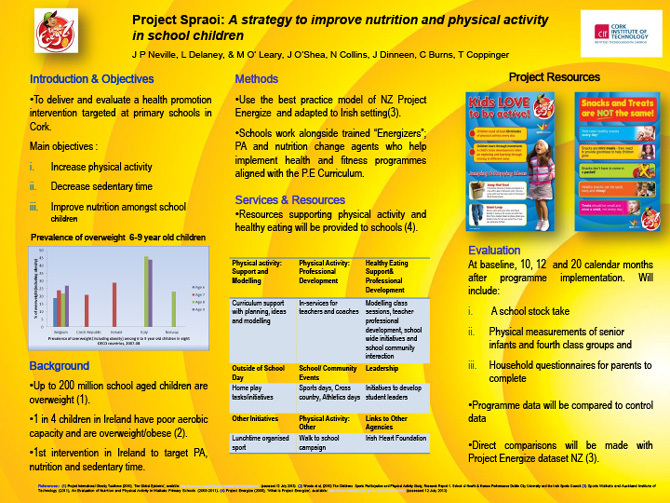 Neville, J.P., Delaney, L., O’ Leary, M., O’Shea, J., Collins, N., Dinneen, J., Burns, C., Coppinger, T. ‘Project Spraoi: A strategy to improve nutrition and physical activity in primary school children’, [poster], presented at the Collaborative European Research Conference (CERC), Cork Institute of Technology, 16 – 18 October 2013.